For over 20 years John Akomfrah has been one of the UK's leading independent filmmakers and artists. He was a founder of the Black Audio Film Collective in 1982, and in 1986 went on to make Handsworth Songs. Since then he has made many more documentaries, as well as features and gallery work, including Mnemosyne, out of which The Nine Muses Grew. In 2008 he was awarded the O.B.E. in the New Year's Honour's list for his services to the film industry. The Nine Muses is a meditation on memory, exile and migration using Homer's The Odyssey and Greek myth as a scaffold on which to build a multi-layered structure. The film mixes crisply beautiful images shot in Alaska with a treasure trove of archive clips from the 40s to the 60s dealing mostly with the early history of post-war migration from the West Indies, Africa and the Indian sub-continent, but also just with the daily life of urban England: work, traffic jams and snow. Laid over these are readings from Milton, Beckett, Joyce and Emily Dickinson amongst others and a collage of music from an original score by Trevor Mathison to Wagner, Schubert, the Gundecha Brothers and Leontyne Price. The resulting cinematic essay becomes a thoroughly immersive, rich and moving experience that has met with considerable critical acclaim, being described as "An immersive and inspirational experience" by David Parkinson in Empire, a "highly engrossing cinematic poem" by Geoff Andrew in Time Out, and Beguiling and often moving" by Tony Quinn in The Independent. 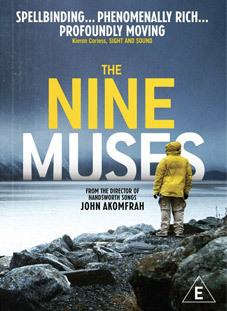 The Nine Muses will be released on UK DVD on 23rd April 2012 by New Wave Films at the RRP of £15.99.